2019 marks the 100th birthday of the enigmatic pianist and composer Herbie Nichols. 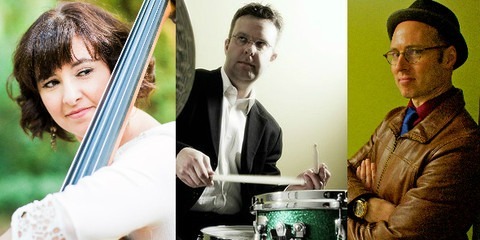 The Yardbird Suite is pleased to present the trio of George Colligan on piano, Jodi Proznick on bass, and Jon McCaslin on drums to explore Nichols’ rarely played compositions and arrangements and celebrate the music of a forgotten genius. A contemporary of Thelonious Monk’s, Herbie Nichols’ music combines elements of bebop, Dixieland and swing with nods to Erik Satie, Bela Bartok and West Indian folk music. A tragically overlooked genius, Nichols was a highly original piano stylist and a composer of tremendous imagination and eclecticism. He wasn’t known widely enough to exert much influence in either department, but his music eventually attracted a cult following his tragic early death from leukemia at the age of 43 in 1963. He was in on the ground floor of bebop but recorded just three brilliant piano trio albums for Blue Note in 1955 and 1956 and a fourth for Bethlehem in late 1957. His music is somewhat similar in style to Monk and aficionados of his music feel that Nichols deserves similar recognition for his compositions. Probably his most famous tune is “Lady Sings the Blues”, recorded most prominently by Billie Holiday. George Colligan is a pianist, organist, drummer, trumpeter, teacher, and bandleader, who is one of the most original and compelling jazz artists of his generation. An award-winning composer and player, Colligan is highly in demand as a sideman, having appeared on over 100 CDs. He has also released over 20 recordings full of his intelligent writing and impressive technique. He is currently an Assistant Professor at Portland State University as well as a member of Jack DeJohnette’s New Quintet. Juno-nominated bassist, composer, bandleader, and educator Jodi Proznick has earned a reputation as one of Canada’s finest jazz artists. She has won numerous National Jazz Awards, including Bassist of the Year in 2008 and 2009. Her group, the Jodi Proznick Quartet, was awarded the Acoustic Group of the Year and Album of the Year in 2008 and the Galaxie Rising Star at the Vancouver International Jazz Festival in 2004. In addition to recording her own albums (most recently “Sun Songs”), Jodi has been featured on over 40 recordings as a side person. Very well-known in Edmonton is Calgary-based drummer Jon McCaslin who was instrumental in bringing Jason Marsalis to the Yardbird Suite in 2015 when we presented a tribute to Herbie Nichols at the time of the 50th anniversary of Nichols’ death. Tickets – $22.00 for EJS members (re-imbursed at the door); $26.00 for non-member/guests, plus applicable fees.